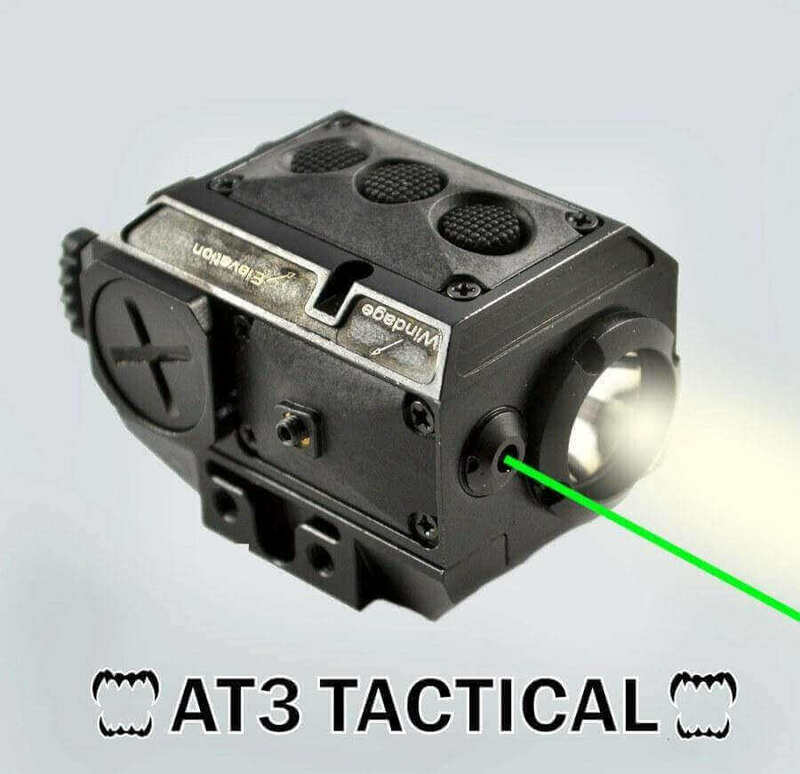 The AT3 Tactical Light & Green Laser Combo LL-02G features a blindingly bright 225 Lumen light and a brilliant green laser visible to 100 yards in daylight. Green lasers are far brighter than red lasers, especially in daylight. Our laser is exceptionally bright (100 yards visibility in broad daylight) and works in temperatures down to 14 degrees F.
The LL-02G features a 225 max lumen LED weapon light with a strobe function. Easy to operate – 3 buttons switch between laser, light, laser light, and toggle the strobe on and off. Recoil tested on everything from a .22 pistol to a 12 gauge, with an anodized aircraft aluminum housing. Also this laser is one of the few green lasers that will operate at sub-freezing temperatures. It’s backed by a 1 year warranty! Q: How do I know if this will fit my handgun? A: Please measure the distance from the front of the trigger guard to the center of the slot on your accessory rail (if your gun has more than 1 slot, measure to the slot closest to the muzzle). If the distance is 1 3/4″ or longer, this will fit! Q: Do you offer a similar product for Subcompact handguns? I am really happy with the LL-02G. Neat little light. The flashlight throws out a nice even cone with good brightness while not being so intense that it will be a problem in small spaces. Nice bright green laser which is visible in full daylight close in. It will remember the selected mode while it is powered up which is nice; press and hold to power on/off, select mode, tap to standby/light. Also, AT3 Tactical Customer service is outstanding! Item was great. Bought a blemished, expected the worst and got the best. Besides the smallest scuff on mounting screw it was in perfect shape. Shipped quickly and without incident. I will be doing business with them again. Let me start by saying that AT3 Tactical customer service is tops! Now on the product, I own 2 green lasers, which reside on top of AR platforms, and must say that even though I would not trust my life on them, for range time and hunting they serve their intended purpose. BTW, one was supposed to be blemished but I couldn't find blemish on it so, thank you AT3.